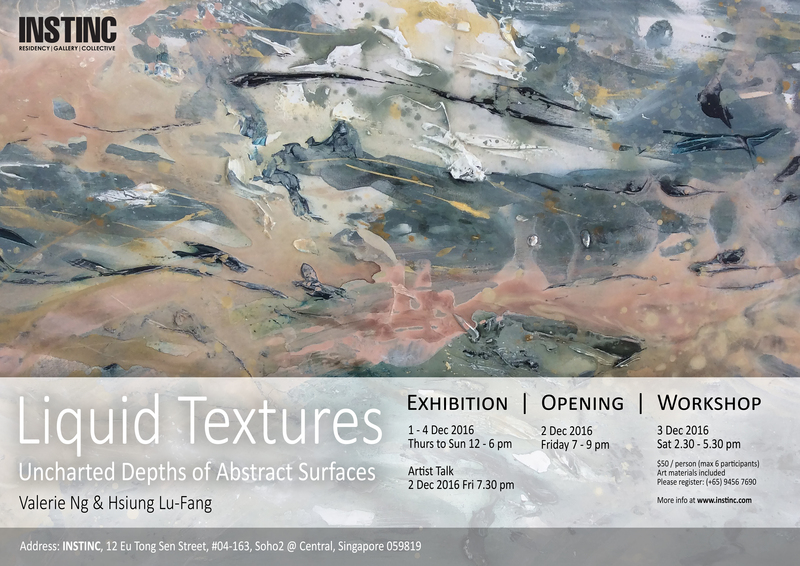 “Liquid Textures: Uncharted Depths of Abstract Surfaces”, comprises an art exhibition, artist talk and workshop. The exhibition features collaborative abstract as well as new individual paintings by Valerie Ng (Malaysia) and Hsiung Lu-Fang (Taiwan), both currently residing in Singapore. 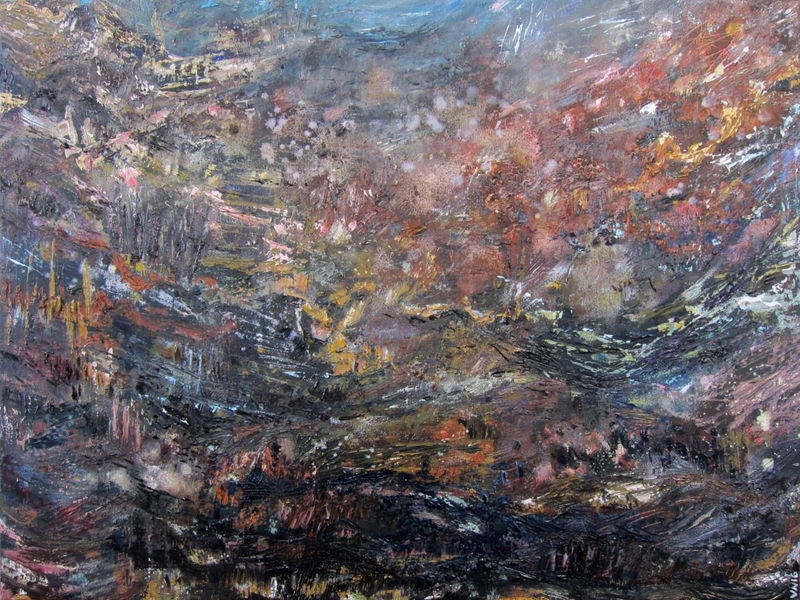 Without a fixed theme in mind, the two artists used process-based techniques as the starting ground for their collaborative painting. The series of abstract paintings that resulted are a divergence from their usual practices, yet retain qualities unique to their individual methods and experiences. Navigating with paint in uncertain directions, often allowing it to create its own path, led to a certain alchemy of marks, conjoined in unified fields. By using gravitational force as a tool and the element of water and impasto textures as material factors in the process, Valerie reflects that the physical painting process unconsciously mimics various actions in nature and results in marks reminiscent of the organic world. At the same time, the artists created these works without specific intent, and focused on the visual and tactile qualities of paint, the feelings evoked by the interaction of colours, lines, forms and textures. Often, the artists worked together on each layer of the paintings simultaneously, and thereafter made shared decisions regarding overlaying certain areas or leaving them to merge with new strokes of paint. Additional layers sometimes unearthed mysterious depths in the works. As such, a painting collaboration can be like engaging in a game, similar to the value of a game of chess being in the experience itself, yet unlike a game of chess, where the experience is the only thing left, perhaps these paintings can afford viewers a moment of visual interest and enjoyment, an opportunity for imagination, and offer a glimpse of that fleeting and shared experience of making the works. Works combining the skills of two art makers with disparate styles, mediums and processes, and with a distinct flavour apart from what they could create by themselves. This is an informal sharing session about the artists’ process of collaboration – their experience, thought processes and methods when working together, as well as a brief introduction to their individual art practices. This workshop highlights the spirit of collaboration in the process of art-making, and would include some art games to facilitate interaction between participants, as well as help loosen up the hand and mind for creative expression. The artists will be on hand to guide the participants in the resulting works, and offer tips on control, balance and composition to help bring the works together. Art materials will be provided and participants will be able to bring home their artworks. Places are limited to a maximum of 6 participants. To sign up, kindly message (+65) 9456 7690, registration closes 25 November. Above: “Earthworks”, 2016, oil on canvas, 84 x 63 cm, by Valerie Ng. Above: “Undivided”, 2016, oil on canvas, 2* 95 x 77 cm, by Valerie Ng. 2016, acrylic on canvas, 48” x 16” or 121.92 x 40.64 cm, by Hsiung Lu-Fang. Above: “Weathering”, 2016, acrylic on canvas, 48” x 16” or 121.92 x 40.64 cm, by Hsiung Lu-Fang. Lu-Fang received her Diploma in Fine Arts from Lasalle College of the Arts, Singapore in 2007, and has worked with a small range of mediums and forms, exploring both representational and abstract paintings, and some sculptural and conceptual work. She has exhibited at art spaces as well as at art fairs. Currently, her paintings can be found in a few private collections, and Farrer Park Hospital, as part of the Farrer Park Company Art Collection. Arising from a fascination with the flowing movement of liquid paint, in 2012 she started to create a series of abstract paintings on canvas which culminated in a joint exhibition “Invisible Connections”. While each work could stand on its own, the works were also all connected through her painting process, with canvases laid on top of each other while liquid paint flowed from one to others; and the key idea behind the artworks was built upon observations of the canvas ground being analogous to material bodies, subject to natural forces and transformation through time, and paint as a metaphor for memories and sensory experiences. Established in 2004, INSTINC is an artist-run institution founded by local artist Yeo Shih Yun, to promote a new language of art. Following the tradition of painting, INSTINC has pushed the paradigm to realize a wide array of art forms, including but not limited to installation, performance and video art. One of INSTINC’s key missions is to encourage collaboration, cultural exchange and sharing of ideas in contemporary art with local as well as international artists. Hence in 2009, INSTINC’s international artist residency program was launched. Through exhibitions, art workshops, artists’ talks & collaborations, INSTINC aims to establish an exciting platform where artists and public can engage with contemporary art and critical discourses. To further promote the contemporary art scene in Singapore, in 2011, INSTINC spearheaded its inaugural “Squares Invasion” Painting Competition in search of artists at the forefront of contemporary painting. In 2014, INSTINC celebrated a decade of art and collaboration with 10 artists from around the world. In 2016, instinctive, a collective of local and international artists was born. Posted in: Liquid Textures. Tags: 2016, exhibition info.